Founded in 1936, the Kazakhstan Soviet Socialist Republic was the second largest republic of the Soviet Union in size (2,049,000 sq. mi./2,715,000 sq. km., about the size of Argentina) and the fourth largest by population (16,000,000 in 1987). It gained its independence from the former Soviet Union in 1991. In 2005, its population stood at 15,185,844. Commonly viewed as a part of Soviet Central Asia (Asiatic Russia), it lies east of the Caspian Sea, sharing a border with China for nearly 3,000 km. (1,860 mi.) farther east and, to the north, with the Russian Soviet Federated Socialist Republic (RSFSR), to which it once belonged. Mennonites first traveled through desert sections of this area during the 1880s when they trekked from the Am Trakt villages to Khiva and Ak Metchet under the leadership of Claas Epp. Settlement in large numbers had its beginnings during World War II when hundreds of thousands of Germans and people of other ethnic backgrounds in western parts of the Soviet Union were forcibly relocated to work camps at Karaganda and other cities of the Kazakhstan republic. After the restricted regime regulations of this period were relaxed around 1955 (Spetskomandantura), many families were reunited. Others moved in from regions further north and east to which they had been scattered by exile and imprisonment during the 1940s. Many church communities, Mennonite and also others (e.g., Lutherans and Catholics), had their beginnings in Kazakhstan during these years. As internal migration continued, some of these were dissolved while several of the major cities became the centers of permanent congregational life. For Germans generally, in 1987 numbering over 900,000 in the republic, Tselinograd became a kind of "capital," while Karaganda, Alma Ata (the actual capital of Kazakhstan), and Dzhambul attracted several thousand Mennonites who lived there in 1987. A Baptist church began to function in Karaganda right after the close of the war, and many Mennonites simply joined this congregation, as they did in various other locations. In 1957 many Mennonites left the Karaganda Baptist Church to form a Mennonite Brethren congregation. The group wanted to conduct services in German and felt that the leader of the Baptist congregation was too strict in forbidding any services to he held outside the church building.The group gained much strength from the leadership of Heinrich Wölk and Wilhelm Mathies who came to Karaganda in 1960 and 1961 respectively. This congregation was registered with the government in 1967 as an autonomous Mennonite Brethren Church, i.e., not belonging to the All-Union Council of Evangelical Christians Baptists (AUCECB). Several years later the congregation put up a building to seat the 900 members who had joined by then. Mathies and Wölk immigrated to West Germany in the 1970s. Others left as well but the congregation in 1987 had more than 1,000 members with Heinrich Goerzen and Alexander Becker serving as leading ministers. Other Mennonites, commonly referred to as Kirchliche Mennonites, began to meet separately also in 1957. They ordained four ministers in 1959, but there were disturbances in the early 1960s, so the group did not really get underway until later in the decade. In 1968 they obtained permission to meet in the Mennonite Brethren church, and continued the joint use of the premises until 1985. At this time they were able to erect and dedicate their own house of worship. Membership had reached about 400 by then, with Julius Siebert acting as leading minister (Ältester [[[Elder (Ältester)|elder]]]) in the congregation. The Kirchliche Mennonite congregation at Alma Ata began with a group who met together for a while at Nitva. It began to meet in Alma Ata in 1960, but was often disrupted for the first six years. In 1966 Cornelius Wiebe led a move to obtain registration of the church. The group received permission to obtain a building in 1973. Registration came later. Many have immigrated to West Germany since then, but the church continued in the late 1980s with a membership under 200. A smaller Kirchliche Mennonite congregation existed as well in Dzhambul, where several unregistered Mennonite Brethren groups were also very active in the 1980s. Epp, Peter. On the Dzhambul congregation. Der Bote (24 September 1986): 4-5; (1 October 1986): 4-5; (8 October 1986): 4-5. Keklabaev, Aloish. Kazakhstan. Moscow: Novosti Press Agency Publishing House, 1987. Sawatsky, Walter. "Mennonite Congregations in the Soviet Union Today." Mennonite Life 33 (March 1978): 12-26. Wölk, Heinrich and Gerhard Wölk. Wilderness Journey: Glimpses of the Mennonite Brethren Church in Russia, 1925-1980. Fresno, CA: Center for Mennonite Brethren Studies, 1982. Available in full electronic text at: https://archive.org/details/WildernessJourneyMennoniteBrethrenChurchInRussiaOcr. A German edition was published in 1981. Klippenstein, Lawrence. "Kazakhstan, Republic of." Global Anabaptist Mennonite Encyclopedia Online. 1990. Web. 20 Apr 2019. http://gameo.org/index.php?title=Kazakhstan,_Republic_of&oldid=163496. Klippenstein, Lawrence. (1990). Kazakhstan, Republic of. Global Anabaptist Mennonite Encyclopedia Online. 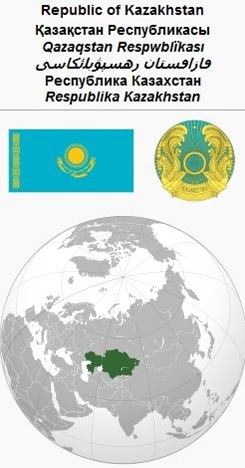 Retrieved 20 April 2019, from http://gameo.org/index.php?title=Kazakhstan,_Republic_of&oldid=163496. Adapted by permission of Herald Press, Harrisonburg, Virginia, from Mennonite Encyclopedia, Vol. 5, pp. 485-486. All rights reserved.